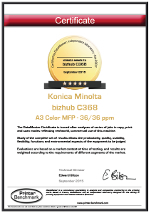 DataMaster is renowned for very, very rarely according the full FIVE-star Evaluation Certificates to the MFPs and digital presses that undergo the DataMaster suite of tests - but we are very pleased to announce that the full FIVE stars have been awarded to the Konica Minolta bizhub C308 / C368 color MFP engine. Tests of productivity in copy, scan and print modes were run on the machines made available to us by the manufacturer, and the machines' and their drivers' usability, flexibility and breadth of functions were assessed. The bizhub C308 / C368 engine came out best in segment for Flexibility and for Usability, and scored very highly in Productivity and Environment too. We like the improved interface, with the options for adding widgets and setting up the user’s own themes – and above all how robust this all is. The ease with which most mobile users can connect is very impressive. The 5-Star Evaluation Certificate and the accompanying Rosette are available for free download from Printer-Benchmark.com, DataMaster’s international website. Radar charts, the full productivity test results and other comparison tools are available on the benchmarking portal, DataMaster Online. DataMaster’s analyses and evaluations are wholly independent. The five-star rating means not only that the machines performed extremely well in most test categories, but also that they did not underperform in any test category.